Champagne is the world's premium sparkling wine the majority of which is made from the traditional Champagne blend of grape varieties. 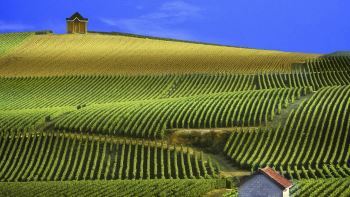 Although very good quality fizz is made elsewhere in France, as well as in other wine-producing countries, only sparkling wine made in the Champagne region itself may be labelled as such. At its best champagne combines freshness, finesse and richness together with a strikingly clean acidity all of which are due to the combination of latitude, climate, geology and the grape varieties of the region which is located eighty miles north east of Paris. Various claims have been made regarding the discovery of the champagne method. Legend in Champagne itself claims that it was the Benedictine monk Dom Pérignon who, having opened a bottle of wine in the cellar of the abbey at Hautvillers one spring day in the 17th. century and finding that a secondary fermentation had begun causing carbon dioxide to become dissolved in the wine thus making it sparkle, ran to his fellow monks claiming that he was “drinking stars”. At this time, however, such secondary fermentation caused by the reactivated yeast was seen as a great problem as the bottles used then were insufficiently strong to withstand the increased pressure causing bottles to explode making cellar work hazardous to say the least. In addition, the first documentation of this claim dates from the late 19th. century. It is true to say, however, that he was a conscientious cellar-master who made several pertinent observations regarding both viticulture and viniculture. The traditional vineyard areas within the Champagne region are the Montagne de Reims, just south of the cathedral city, favouring Pinot Noir, the Valley de la Marne to the west which is mostly planted with Pinot Meunier and the Côte des Blancs to the south of Épernay which grows excellent Chardonnay grapes. Further south in the Aube department lies the Côte des Bar, once primarily a source of Pinot Noir grapes for the grande marque champagne houses further north in Rheims, Epernay and Aÿ but today more well known for its grower-produced champagnes taking their cue from the vineyards of Burgundy which, with their emphasis on individual terroir rather than on champagne as a wine made from blending grapes sourced from across the region, have become something of a revelation. The first three vineyard areas have a geology of chalk which provides excellent drainage whilst also retaining moisture for the vines' deep roots when needed. Chalk also retains heat to warm the vineyards and grows grapes rich in nitrogen which increases yeast activity thus improving fermentation. A further advantage is that this comparitively soft material is easily excavated for the construction of underground caves to be used as cellars. The Côte des Bar, by contrast, has a geology more akin to that of Chablis to the south, with a mix of Kimmeridgian clay and limestone. The current delimited vineyard area has been fully planted for some time and there are now changes planned to come into effect in the next few years which will see the expansion of the area under vine to encompass forty new villages to meet increasing demand for champagne grapes. The champagne business continues to grow. The grande marque champagne houses, such as Moët & Chandon, Bollinger, Louis Roederer et al, have built their reputation on blending non-vintage wines to create a house style which is consistent from year to year. 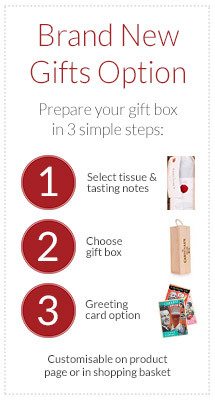 Older reserve wines add richness and help to define that style. The best of these wines are kept on the lees (the dead yeast cells) following their secondary fermentation for rather longer than the minimum 15 months (or 3 years for vintage champagne) stipulated by the regulations in order to allow for the complexity of flavours to develop. The emergence of grower champagnes has not been limited to the Côte des Bar with critics and consumers showing great interest in a number of smaller, quality conscious champagne producers. Nonetheless, due to the fact that the biggest companies grow only a fraction of the grapes they require a large proportion is bought in from growers across the region. Traditionally the price paid for grapes throughout the Marne department was determined by the grading of the village, a system known as the “Échelle des Crus” or “ladder of growths”. Grand Cru villages are rated at 100%, premier crus at between 90% - 99% with the lower rated vineyards rated at between 80% - 89%. Prices were fixed each year with growers receiving the price appropriate to their village, i.e. 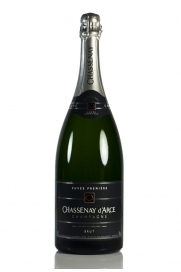 a grower in a premier cru village rated at 97% would receive 97% of the designated price in any given year. Nowadays the system is less rigid with a trend towards acknowledging differing terroirs within villages and the champagne houses willing to offer higher rates for grapes from specific sites considered to be superior. The exclusion of the Aube from this rating system is likely to have been a factor in the increase in grower produced champagnes throughout this department. 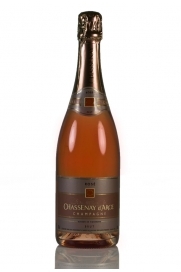 Rosé Brut Champagne from Chassenay d'Arce made from a blend of 65% Pinot Noir with 35% Chardonnay grapes to produce a Champagne with elegance and finesse. 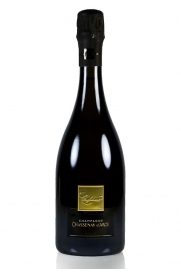 Superb luxury cuvée from Chassenay d'Arce made from 100% Pinot Noir grapes harvested from selected plots. 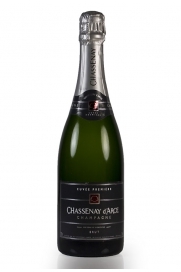 Released with 6 years bottle age this Champagne has an extremely fine mousse. 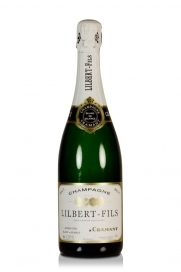 Robert Parker's Wine Advocate described this Blanc de Blancs Grand Cru Lilbert & Fils non-vintage Champagne as showing "gorgeous balance all the way through to the crisp well-articulated finish" and "flowing with the essence of white peaches, flowers, minerals and citrus".